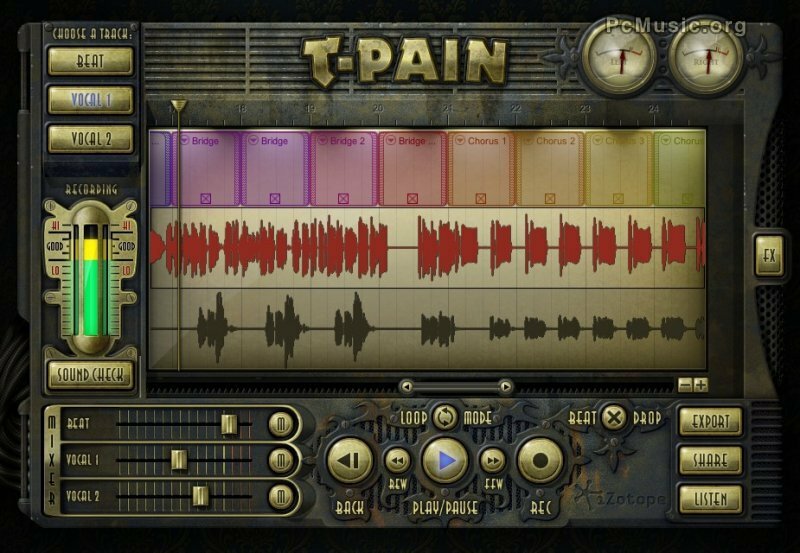 The T-Pain Effect centers on The T-Pain Engine, a self-contained beat-making and vocal recording application for PC and Mac. Aspiring artists can get started immediately by selecting from over 50 professionally crafted song templates comprised of hundreds of T-Pain approved beats. With the backing track in place, users can then sing, rap, or speak on one or two vocal tracks to record a song with ease. Beats and song arrangements can be customized and vocals can be edited, including punch-in recording for retakes. For more vocal flavor, users can add The T-Pain Effect to the vocal tracks, tweaking the hardness and softness controls to dial in just the right sound. Then, after adjusting the levels of the final mix, the completed song can be exported and shared with friends or published directly to SoundCloud to share with the online world.